Montessori is a scientific method of education developed by Dr. Maria Montessori over a hundred years ago. This method emphasizes the simple truth, children learn best when allowed to discover concepts on their own. As children flow from area to area learning through a carefully prepared environment, they absorb knowledge through their meaningful work. Dr. Montessori believed children go through very specific developmental levels, during each of which they exhibit different learning characteristics and different needs. The educational setting must change at each developmental level and should correlate with the psychological characteristics of that plane of development. As each skill is mastered, teachers introduce new challenges, creating a solid foundation for the progressively more abstract concepts to come. Dr. Montessori discovered environment plays a major factor in child development—children effortlessly absorb knowledge from their surroundings. Graduates of Montessori education are generally creative, curious, and independent world citizens who are committed to life-long learning. Their experience in a Montessori classroom encourages a deep respect for themselves, others and the world around them. Dr. Maria Montessori, born in Italy in 1870, became one of Italy’s first female physicians. As a doctor, she initially administered to children’s physical needs and ailments, but her intellectual curiosity led her to explore children’s minds and how they learn. After years of observation, a method of education was developed that meets the needs of the “whole child”. Dr. Maria Montessori quickly became famous for her remarkable success and innovative work with children. Montessori Education was introduced in the United States in 1912, with one of the early schools being established by Alexander Graham Bell in his own home. 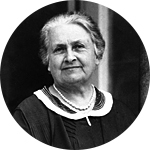 Out of her love and reverence for the individual beauty and potential of children grew the Montessori Method. She remained an active international educational leader until her death in 1952. Dr. Maria Montessori developed the educational approach now known as the Montessori Method. You will never see teachers’ desks in a Montessori classroom or sterile rooms where kids are being fed all the “right” answers. Learning respect for others, fostering their own intelligence, and developing a sense of independence, self-confidence, self-discipline, and intrinsic motivation are the ultimate goals of a Montessori student’s education. The Montessori Method enables students to learn the value of doing things for themselves, develop strong work habits, and foster a solid sense of responsibility-all characteristics that will benefit them during their entire academic careers and throughout their adult lives. ©2014, Montessori Children's Room. All Rights Reserved.